By now the local markets are stacked with a large variety of young and fresh vegetables, such as asparagus, radishes, carrots or rhubarb. The latter is categorized often as fruit, although it’s only the stalk of a plant. Probably it’s considered as a fruit, because it’s mainly consumed sweetened by sugar or syrups. Savory interpretations of rhubarb are rare, which is unfortunate, because the tart aroma of rhubarb adds freshness to a plate and replaces vinegars perfectly in spring or summer dishes. In this dish below I used rhubarb as a refreshing sour element. 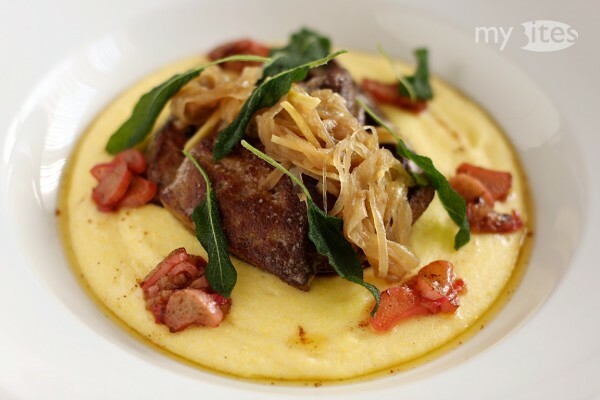 This entry was posted in Calf, Main Course and tagged calf, ginger, ginger marmalade, liver, main course, onion, onion marmalade, polenta, rhubarb, sage on May 21, 2012 by Robert. Although I was inspired by a combination I collected via Foodpairing, most pairings featured in this starter are quite well known. For example broccoli is often served with almond flakes, where the almond can be replaced by other nuts, such as hazelnut or peanut. I always use the broccoli stem as well, which reminds me of kohlrabi – so pairing broccoli and kohlrabi was straight-forward. Figs might sound a little bit strange, but I already made figs and broccoli work together previously. The dish below unites the aforementioned pairings in a vegan appetizer. 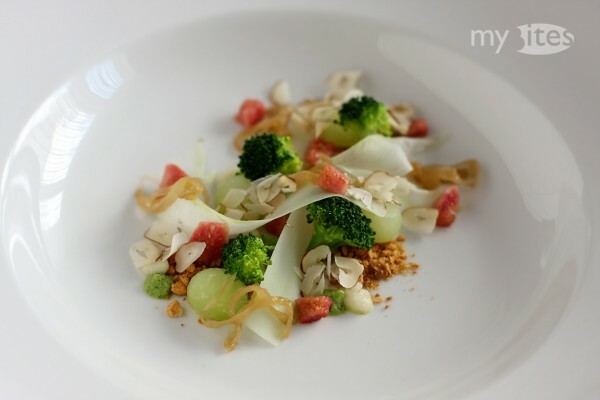 This entry was posted in Appetizer, Vegan, Vegetarian and tagged appetizer, broccoli, fig, hazelnut, kohlrabi, onion, onion marmalade, peanut, starter, vegan, vegetarian on March 27, 2012 by Robert.